US smart meter product and service demand is projected to increase 11.3 percent annually to $4.4 billion in 2016. Gains will be driven by the rising penetration of smart meters, particularly advanced metering infrastructure (AMI) products. 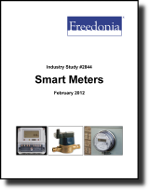 The rising share of smart meters in use will support demand for parts and services.